Hypocenter depth recalculated from 597.0 to 602.0 km. Jun 11 02:55: Magnitude recalculated from 5.1 to 5.0. Hypocenter depth recalculated from 602.0 to 599.0 km. Hypocenter depth recalculated from 599.0 to 598.0 km. 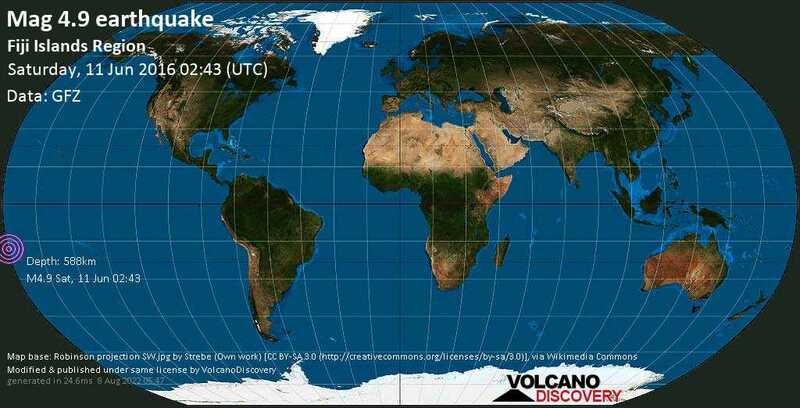 Jun 11 02:57: Magnitude recalculated from 5.0 to 4.9. Hypocenter depth recalculated from 598.0 to 588.0 km. Hypocenter depth recalculated from 588.0 to 589.0 km. Hypocenter depth recalculated from 589.0 to 588.0 km.